Meet your local guide in Pearl River, LA where he will take you on a two-hour tour through a variety of ecosystems. The small flatboat has been customized with comfortable seating and can navigate into areas the other tour boats can't reach. Ask your guide all the questions you want and have a more personalized tour. Get an authentic and educational experience, and see alligators, exotic birds, turtles, snakes and more. Private tour with a maximum of 6 passengers per booking. Upon booking, you will receive an email with directions and what to bring on your tour. The boat tour is located 45 minutes East of New Orleans in Pearl River, LA. Transportation is not provided to the boat launch. Meet the tour captain at the East Pearl River Boat Launch 10 mins before your arranged departure time. Board the flatboat and enjoy the Honey Island Swamp. Children under 16 must wear a life jacket, the boat has 3 kids life jackets available, if you are bringing an infant or toddler please bring an appropriately sized life jacket. 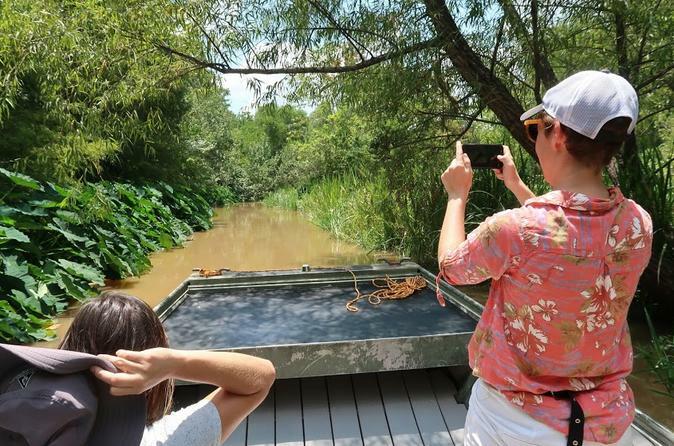 The tour will take you through the Honey Island Swamp, stopping at a few locations along the way to learn about alligators, cypress trees and more about the local ecosystems. Keep your eyes peeled for birds like Great Blue Herons, Egrets, Kingfishers, Pileated Woodpeckers, hawks and owls. Along the way, you may also see alligators, snakes, turtles, nutria, wild pigs and other creatures. Take a slow ride through Friday's Ditch, where you will see large Elephant Ear and Palmetto Plants. See Indian Village, where river shacks and traditional houseboats float nearby. After 2 hours we will return to the dock and guests will depart.